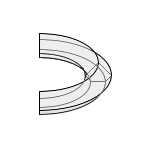 Calculations at a toroid sector, a piece cut straight out of a toroid. The size of the piece is determined by the angle of intersection originating at the center. An angle of 360° covers the whole toroid. Enter the angle of intersection as well as radius, base perimeter and base area of the original toroid. Choose the number of decimal places, then click Calculate. Please enter angles in degrees, here you can convert angle units. Radius and perimeter have the same unit (e.g. meter), the areas have this unit squared (e.g. square meter), the volume has this unit to the power of three (e.g. cubic meter). A/V has this unit -1.